Bangor is pretty close to some great places to visit for a day trip. Bar Harbor and Acadia National Park are only 50 miles to the east; the Camden Hills are only 50 miles to the south and Baxter State Park, the gateway to the famed northern Maine woods, is only 70 miles to the north. 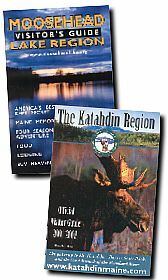 The Moosehead Lake region, known for its moose, fishing and back country camping, is only 70 miles to the west. So pack your camera and bring plenty of film, and don't forget the sunglasses, sunscreen, insect repellant and hiking boots. 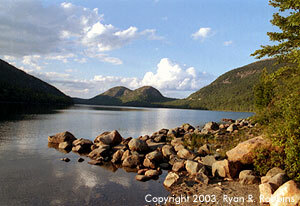 Acadia National Park, on Mount Desert Island, is only 50 miles from Bangor. The beauty of Mount Desert Island is unsurpassed. From the moment you drive over the causeway and over the bridge from the mainland, the emerald-green saltwater lapping at seaweed-laden rocks and the pine trees whose roots have clamped onto the rocks at the shore's edge will entice you to take photo after photo. Do not forget your camera when visiting Mount Desert Island and Acadia National Park. And if you do, buy a couple of disposable cameras. Acadia National Park may be one of the smallest in the national park system, but it is one of the most-visited, with July and August the peak months. The best and easiest way to see everything the park has to offer is to take Loop Road, which winds around the coastline for more than 20 miles. The park's highlights include Cadillac Mountain, the highest mountain on the eastern seaboard for both North and South America. You can hike up the mountain or drive. Be warned, though: The access road is narrow in many places and looking down may cause vertigo. The mountain's summit features almost 360 degrees of breathtaking views of the Atlantic Ocean and the mainland. Sand Beach is a popular destination. The sand beach is one of very few to be found north of Portland. Although it is a haven for those looking to get a tan or play in the sand, the water is often too cold to spend much, if any, time in. South of Sand beach is Thunder Hole, a sea cave carved into exposed bedrock by powerful waves from the Atlantic. The name comes from the sound the waves make when they push air into the cave and then recede and release the air. Thunder Hole is at its best when the tide is coming in. Otherwise, you may be disappointed and get nothing more than a whimper. The absolute best time to catch Thunder Hole in action is in the fall, according to park officials. If you run out of film or want refreshments, the park service runs a small shop across the road. Otter Point is a little farther south on Loop Road. This area of the park is one of the most picturesque, especially near Otter Cliffs, which rise almost 100 feet straight up from the ocean. A strong word of caution: you must pay attention when walking around the cliffs or climbing around the rocks, and you must wear shoes. People have slipped and fallen to their deaths in this area. Also, no matter where you are in the park, be careful around the crashing surf. Mother Nature can be beautiful in what it offers at Acadia, but it is also deadly to those who don't respect its strength. Waves can and have swept people offshore. If you have children, supervise them at all times and reconsider taking them up close to the waves. 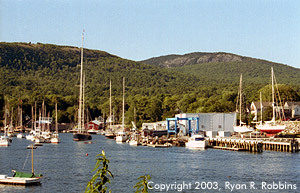 Mount Battie (left) and Mount Megunticook (right) overlook Camden Harbor. The Camden Hills area has been inspiring writers and artists for years. Edna St. Vincent Millay spent much of her time in what is now Camden Hills State Park. Painter Andy Wyeth and his family have called the nearby town of Cushing home for the summer for decades. Wyeth did his most famous painting -- "Christina's World" -- in the small town. You can now tour the actual farm Christina Olson lived on and see firsthand the rugged landscape that has inspired hundreds of Wyeth paintings. The village of Camden's slogan is "Where the Mountains Meet the Sea" -- most appropriate because, aside from Mount Desert Island, nowhere else on the eastern seaboard of the United States do the mountains meet the sea. The town of about 5,000 bustles in the summer, its population swelling more than twice its year-round number. Small shops along Main Street provide visitors with glimpses of typical Maine humor, which is often dry, self-deprecating and downright hokey at times. The Smiling Cow, a shop that offers Maine-related trinkets of just about all kinds, is a must-see. The rear of the store offers a nice view of Camden Harbor. Downtown Camden features no traffic lights in the immediate area, so expect to drive at a crawl when you enter the village. Watch out for pedestrians. In fact, seeing the town on foot is the most convenient and least frustrating way to do it. Camden Hills State Park offers more than 20 miles of hiking trails, the best of which is Mount Megunticook Trail. The trail is only 1 mile long, but it takes at least 45 minutes to cover as it winds almost straight up Mount Mengunticook, the highest of the Camden Hills, at 1,380 feet. The hike is through the woods until Ocean Lookout, which offers a sweeping view of the region from 1,300 feet. On a nice clear day you can see the other Camden hills and the far reaches of the southern end of Penobscot Bay. If you have more adventure in you, you can continue from Ocean Lookout to the wooded summit and then pick up the 2 ½-mile Ridge Trail. This trail goes over mostly granite terrain, with dizzying views of Lake Megunticook below. The trail ends at Maiden Cliff, where according to lore a young girl fell to her death while chasing her windblown hat during a family picnic. A white cross on the 800-foot cliff marks her fall. Although U.S. Route 1 is the quickest way to get from Bangor to Camden, you should consider taking Route 52 to Belfast on your return trip. As the road hugs the edge of Lake Megunticook and the base of the Mount Megunticook cliffs, the cliffs appear to rise majestically from the road as you head away from Camden. While you're in the area, you won't want to miss seeing Rockport, Rockland and even Thomaston and Cushing if you have enough time. 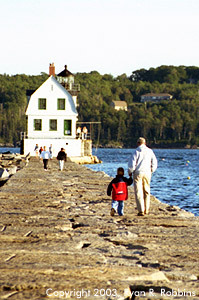 The Rockland Breakwater enables visitors to walk almost a mile into Rockland Harbor. Rockport Harbor was the home for Andre the Seal, who entertained young and old alike from a pen in the middle of the harbor during the late-1970s through mid-1980s. A local fisherman rescued the abandoned baby seal, who adopted the fisherman's family and became such a star that he inspired a book and a movie on his life. Each fall Andre would swim to the New England Aquarium in Boston to spend the winter. And in the spring he would swim Down East and back home. He was found dead in July 1986 after apparently losing a fight with another seal. A statue of Andre overlooking the harbor pays tribute to the lovable seal. Rockland is next door to Rockport. The coastal city of about 8,000 calls itself the Lobster Capital of the World, a title few -- if any -- towns in the world have disputed. Early each August the city holds the Lobster Festival to celebrate the tasty crustacean that the city owes much of its existence to. To get a close look at lobstering, a walk along the Rockland Breakwater is a must. The 4,346-foot breakwater reaches into Rockland Harbor and brings visitors close to dozens of lobster traps, many of which are within a few hundred feet. You might even be able to watch a lobsterman check and dump his traps. Built in the late-1800s to protect Rockland Harbor from strong waves, the breakwater consists of 697,000 tons of local granite. The breakwater is 175 feet at the base on the harbor floor -- 60 feet below the surface of the water at high tide -- and 43 feet wide at the top. It took 18 years to build. A lighthouse built in 1902 awaits visitors at the end of the breakwater. To reach the breakwater, take Waldo Avenue, off U.S. Route 1, then Samoset Road. The Farnsworth Art Museum, in downtown Rockland, features one of the finest collections of Wyeth family paintings. The Wyeths have had a summer home in nearby Cushing for decades. The Farnsworth's entire holdings may very well be the best collection of paintings anywhere in the state. Next door to Rockland, the seafaring community of Thomaston doesn't have much to offer visitors in terms of activities and destinations. But a drive through the town's quaint streets that oversee the water will provide a glimpse of the dependence the town's earliest residents had on the water. With more than 200,000 acres of pristine land far removed from most of Maine's population base, Baxter State Park has captured the hearts and imaginations of nearly all who have visited. Gov. Percival Baxter donated to the state more than 5,000 acres of land for the park in 1931, and made his last donation in the 1960s. Each winter, hundreds of hopefuls camp outdoors to be first in line to reserve a camp at the park for the summer. The park's biggest draw is Mount Katahdin, which at 5,268 feet is Maine's highest mountain. Although the peak is not accessible by motor vehicle, hikers of all abilities can find an appropriate trail to the summit, which marks the beginning of the Appalachian Trail. The park features about 175 miles of hiking trails and 18 mountain peaks and ridges that exceed 3,000 feet. Baxter State Park: Balsam Drive, Millinocket. (207) 723-5140. 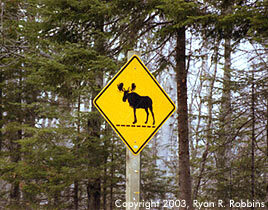 Moose crossing signs are almost as plentiful as stop signs in the Moosehead Lake region, about 70 miles west of Bangor. Follow in the footsteps of Henry David Thoreau and visit Greenville and Moosehead Lake, in one of the state's most remote areas. Thoreau based his "The Maine Woods" essays on his frequent trips to the Moosehead region from Bangor. Moosehead is Maine's largest lake at 40 miles long and 10 miles wide. The SS Katahdin, anchored in downtown Greenville, provides tours of the lake. To see the region's many lakes by air, you can hire a sea plane, which is as much a part of life in the area in the summer as a snowmobile in the winter. Moosehead gets its name from the shape of the lake, not from the region's most popular wildlife. The state animal is plentiful in the area, though. Each fall the state issues about 2,000 permits to hunt moose through a lottery, with a majority of permits for hunting in the area. Winning a permit almost guarantees a trophy: more than 85 percent of moose hunters get one. In the summer, the lakes and streams are perfect for fishing.